Xanthan gum (/ˈzænθən/) is a polysaccharide with many industrial uses, including as a common food additive. It is an effective thickening agent and stabilizer to prevent ingredients from separating. It can be produced from simple sugars using a fermentation process, and derives its name from the species of bacteria used, Xanthomonas campestris. Xanthan gum was discovered by Allene Rosalind Jeanes and her research team at the United States Department of Agriculture, and brought into commercial production by CP Kelco under the trade name Kelzan® in the early 1960s. It was approved for use in foods in 1968 and is accepted as a safe food additive in the USA, Canada, European countries, and many other countries, with E number E415, and CAS number 11138-66-2. Xanthan gum derives its name from the species of bacteria used during the fermentation process, Xanthomonas campestris. This is the same bacterium responsible for causing black rot to form on broccoli, cauliflower, and other leafy vegetables. Xanthan gum, 1%, can produce a significant increase in the viscosity of a liquid. In foods, xanthan gum is common in salad dressings and sauces. It helps to prevent oil separation by stabilizing the emulsion, although it is not an emulsifier. Xanthan gum also helps suspend solid particles, such as spices. Xanthan gum helps create the desired texture in many ice creams. Toothpaste often contains xanthan gum as a binder to keep the product uniform. Xanthan gum also helps thicken commercial egg substitutes made from egg whites, to replace the fat and emulsifiers found in yolks. It is also a preferred method of thickening liquids for those with swallowing disorders, since it does not change the color or flavor of foods or beverages at typical use levels. In gluten-free baking, xanthan gum is used to give the dough or batter the stickiness that would otherwise be achieved with gluten. In most foods, it is used at concentrations of 0.5% or less. Xanthan gum is used in wide range food products, such as sauces, dressings, meat and poultry products, bakery products, confectionery products, beverages, dairy products, others. In the oil industry, xanthan gum is used in large quantities to thicken drilling mud. These fluids serve to carry the solids cut by the drilling bit back to the surface. Xanthan gum provides great "low end" rheology. When the circulation stops, the solids still remain suspended in the drilling fluid. The widespread use of horizontal drilling and the demand for good control of drilled solids has led to its expanded use. It has also been added to concrete poured underwater, to increase its viscosity and prevent washout. In cosmetics, xanthan gum is used to prepare water gels. It is also used in oil-in-water emulsions to enhance droplet coalescence. Xanthan gum is under preliminary research for its potential uses in tissue engineering to construct hydrogels and scaffolds supporting three-dimensional tissue formation. The viscosity of xanthan gum solutions decreases with higher shear rates; this is called shear thinning or pseudoplasticity. This means that a product subjected to shear, whether from mixing, shaking or even chewing, will thin out, but, once the shear forces are removed, the food will thicken back up. In salad dressing, for example, the addition of xanthan gum makes it thick enough at rest in the bottle to keep the mixture fairly homogeneous, but the shear forces generated by shaking and pouring thins it, so it can be easily poured. When it exits the bottle, the shear forces are removed and it thickens again, so it clings to the salad. The greater the ratio of xanthan gum added to a liquid, the thicker the liquid will become. An emulsion can be formed with as little as 0.1% (by weight). Increasing the amount of gum gives a thicker, more stable emulsion up to 1% xanthan gum. A teaspoon of xanthan gum weighs about 2.5 grams and brings one cup (250 ml) of water to a 1% concentration. On May 20, 2011, the FDA issued a press release about SimplyThick, a food-thickening additive containing xanthan gum as the active ingredient, warning parents, caregivers and health care providers not to feed SimplyThick, a thickening product, to premature infants The concern is that the product may cause premature infants to suffer necrotizing enterocolitis. According to a 2017 safety review by a scientific panel of the European Food Safety Authority (EFSA), xanthan gum (European food additive number E 415) is extensively digested during intestinal fermentation, and causes no adverse effects, even at high intake amounts. The EFSA panel found no concern about genotoxicity from long-term consumption. EFSA concluded that there is no safety concern for the general population when xanthan gum is consumed as a food additive. Xanthan gum is produced by the fermentation of glucose and sucrose. The polysaccharide is prepared by the bacteria being inoculated into a sterile aqueous solution of carbohydrate(s), a source of nitrogen, dipotassium phosphate, and some trace elements. The medium is well-aerated and stirred, and the xanthan polymer is produced extracellularly into the medium. After one to four days, the polymer is precipitated from the medium by the addition of isopropyl alcohol, and the precipitate is dried and milled to give a powder that is readily soluble in water or brine. It is composed of pentasaccharide repeat units, comprising glucose, mannose, and glucuronic acid in the molar ratio 2:2:1. A strain of X. campestris has been developed that will grow on lactose - which allows it to be used to process whey, a waste product of cheese production. This can produce 30 g/L of xanthan gum for every 40 g/L of whey powder. Whey-derived xanthan gum is commonly used in many commercial products, such as shampoos and salad dressings. Synthesis originates from glucose as substrate for synthesis of the sugar nucleotides precursors UDP-glucose, UDP-glucuronate, and GDP-mannose that are required for building the pentasaccharide repeat unit. This links the synthesis of xanthan to carbohydrate metabolism. The repeat units are built up at undecaprenylphosphate lipid carriers that are anchored in the cytoplasmic membrane. Specific glycosyltransferases sequentially transfer the sugar moieties of the nucleotide sugar xanthan precursors to the lipid carriers. Acetyl and pyruvyl residues are added as non-carbohydrate decorations. Mature repeat units are polymerized and exported in a way resembling the Wzy-dependent polysaccharide synthesis mechanism of Enterobacteriaceae. Products of the gum gene cluster drive synthesis, polymerization, and export of the repeat unit. ^ "Sicherheitsdatenblatt des Herstellers Carl-Roth" (PDF). Archived (PDF) from the original on 2011-07-18. Retrieved 2011-04-18. ^ Whistler, Roy, L, and BeMiller, James N., eds Industrial Gums: Polysaccharides and their Derivatives Academic Press (1973) ISBN 0-12-746252-X. ^ "KELZAN® Xanthan Gum - CP Kelco". cpkelco.com. CP Kelco. Feb 18, 2019. Retrieved Feb 18, 2019. CP Kelco offers a range of biopolymers to thicken, suspend and stabilize emulsions and other water-based systems. The KELZAN® xanthan gum line of industrial products can be used to modify the texture of industrial products and to stabilize household cleaners, fabric care products, suspensions, oil-in-water emulsions and foams against separation. ^ Davidson, Robert L. (1980). Handbook of Water-soluble Gums and Resins. McGraw Hill. ISBN 978-0-07-015471-1. ^ a b cuisine, m. (2014). Xanthan Gum. Retrieved from modernist cuisine: "Xanthan Gum". 2012-11-27. Archived from the original on 2014-06-18. Retrieved 2014-06-21. ^ "Oilfield Glossary - xanthan gum". www.glossary.oilfield.slb.com. Schlumberger. Archived from the original on 12 February 2017. Retrieved 30 April 2017. ^ a b Kumar, A.; Rao, K. M.; Han, S. S. (2018). "Application of xanthan gum as polysaccharide in tissue engineering: A review". 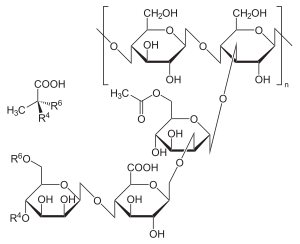 Carbohydrate Polymers. 180: 128–144. doi:10.1016/j.carbpol.2017.10.009. PMID 29103488. ^ Ye, Aiqian; Hemar, Yacine; Singh, Harjinder (2004-08-25). "Influence of polysaccharides on the rate of coalescence in oil-in-water emulsions formed with highly hydrolyzed whey proteins". Journal of Agricultural and Food Chemistry. 52 (17): 5491–5498. doi:10.1021/jf030762o. ISSN 0021-8561. PMID 15315390. ^ Tests and measurements of xanthan gum "Xanthan gum: Get past the weird and it's magical". Archived from the original on 2016-03-04. Retrieved 2016-01-02. ^ Sargent, EV. ; Adolph, J.; Clemmons, MK. ; Kirk, GD. ; Pena, BM. ; Fedoruk, MJ. (Jul 1990). "Evaluation of flu-like symptoms in workers handling xanthan gum powder". J Occup Med. 32 (7): 625–30. doi:10.1097/00043764-199007000-00014. PMID 2391577. ^ a b c d e f g h EFSA Panel on Food Additives and Nutrient Sources (14 July 2017). "Re‐evaluation of xanthan gum (E 415) as a food additive". EFSA Journal. European Food Safety Authority. 15 (2): e04909. doi:10.2903/j.efsa.2017.4909. Retrieved 1 March 2019. ^ Garcı́a-Ochoa, F; Santos, V.E; Casas, J.A; Gómez, E (2000). "Xanthan gum: production, recovery, and properties". Biotechnology Advances. 18 (7): 549–579. doi:10.1016/S0734-9750(00)00050-1. ISSN 0734-9750. ^ Tortora, G.J., Funke, B.R., & Case, C.L. (2010). Microbiology: An Introduction, 10th edition. San Francisco: Benjamin Cummings. Pg. 801. ^ Becker and Vorholter (2009). "Xanthan Biosynthesis by Xanthomonas Bacteria: An Overview of the Current Biochemical and Genomic Data". Microbial Production of Biopolymers and Polymer Precursors. Caister Academic Press. ISBN 978-1-904455-36-3.